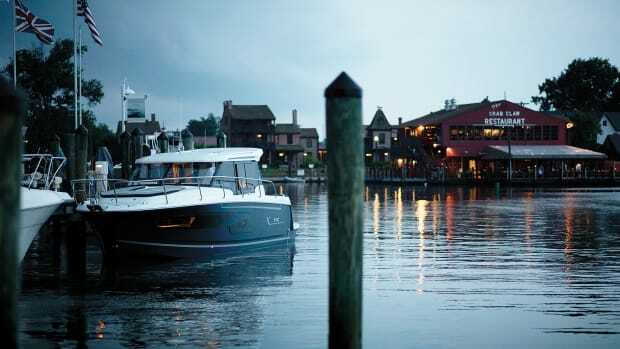 An overnight cruise to an Eastern Shore town illuminates the notable features on board this family cruiser. 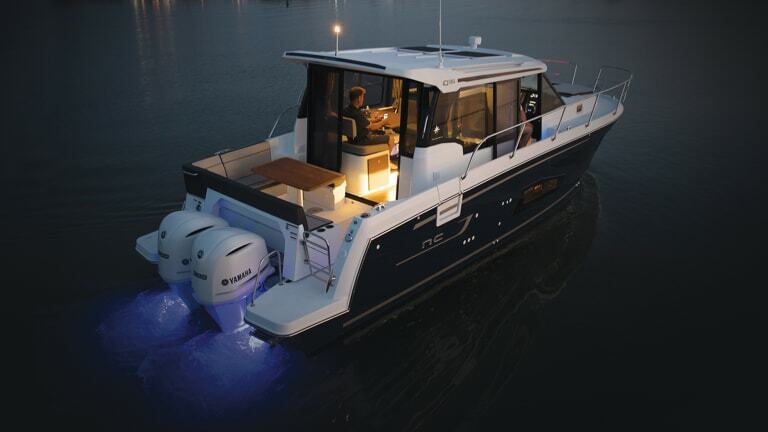 When I first met the outboard-powered 34-foot NC 1095 at a debut event last summer in Annapolis, I mentioned to Nicolas Harvey, president of Jeanneau America that I’d love to see the boat used the way its designers envisioned. I suggested an overnight cruise to an Eastern Shore town, to which he quickly agreed. 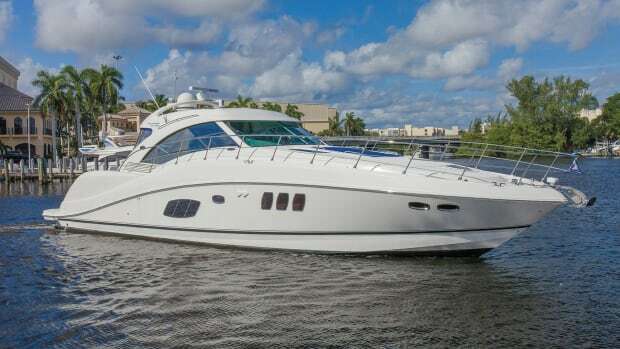 Harvey describes the newcomer as “A family cruiser that blends comfort and usability, even during the hot, humid rainy days of summer. And it will perform this way in all kinds of climates.” He had a point, to be sure. But because the boat we drove from Annapolis to St. Michaels had no optional genset, we relied on natural ventilation while underway. 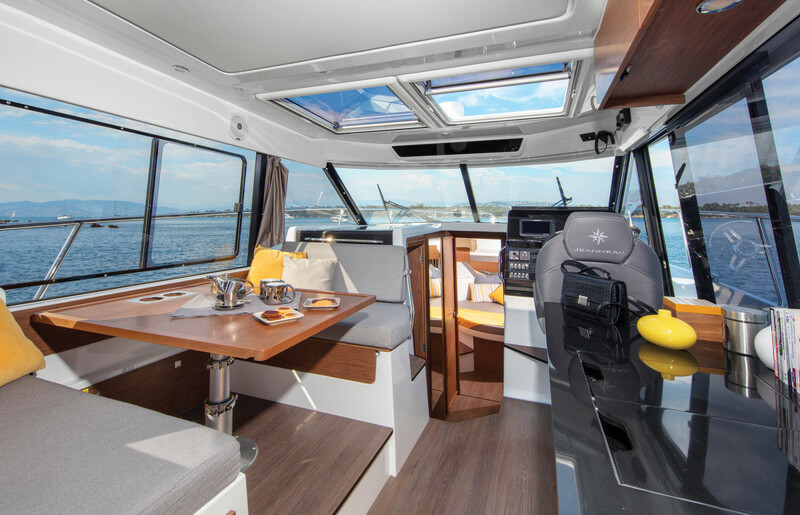 There are a number of ways to control ventilation, chiefly the three-panel aft glass bulkhead door, which slid to port to store in the width of a single panel, allowing easy access to the aft deck. 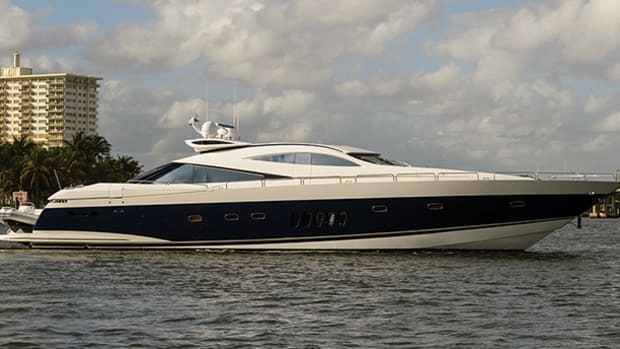 Some might wish to call that aft deck the cockpit, but it is the same height as the main cabin sole for one-level living. 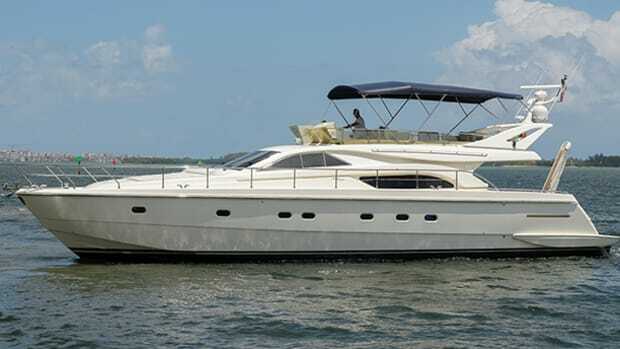 For those boarding from floating docks, there’s a split swim platform surrounding the transom motor mounting area, plus a low gate to starboard. The aft bench, which offers loads of storage inside, is affixed to floor-mounted rails that allow it to slide forward, creating room for the outboard engine heads to store at an angle that keeps the lower units out of the water. 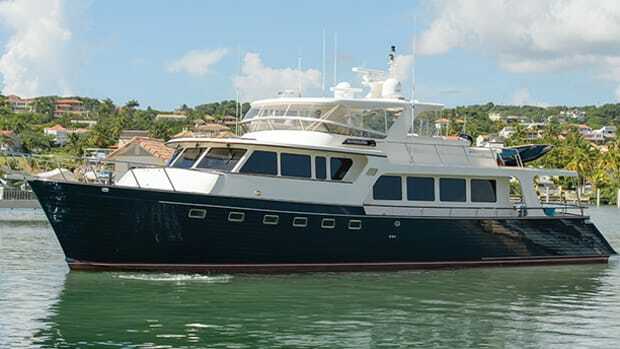 Another notable feature is the recessed walkable side deck to starboard, connecting the aft deck to the foredeck with a low bulwark topped with handrails that stretch from the bow to the aft end of the deckhouse. Handrails on the edge of the hardtop add safety for both side decks, appreciated by those working on the port side deck, which is not recessed. 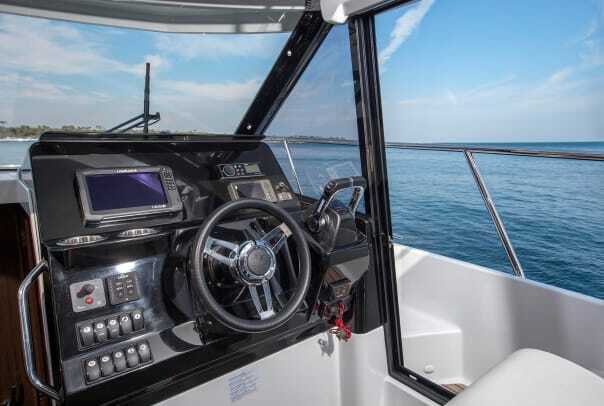 For easy single-handed docking and casting off, the sliding door starboard allows the helmsman to hand over or take a mooring line, or even fasten a temporary midships mooring line when the dock height is just right. 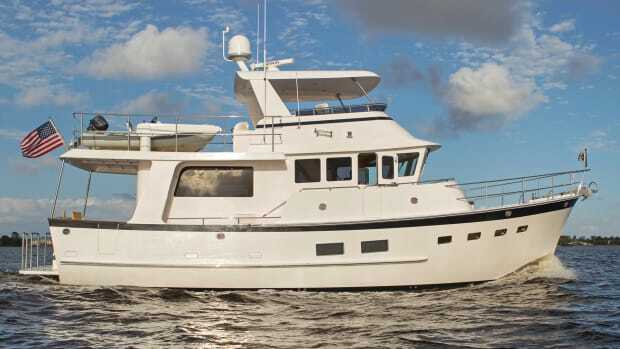 Stairs near the helm lead down to the accommodations, a spacious three-cabin and enclosed head layout. 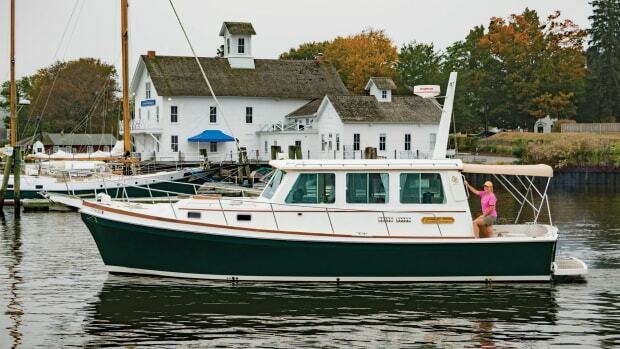 I overnighted in the owner’s cabin forward, and found the island berth easily long enough for my tall frame, and shaped to allow access to both sides. Two bonded, fixed windows and two overhead hatches (one opens) helped transform this space that might have been dark and unappealing into a desirable stateroom. Taking the wheel of the NC 1095 is great fun for a number of reasons. The single helm chair adjusts fore and aft, and has a flip-up bolster for those who love to stand and lean. Jeanneau’s designers have done a good job eliminating most of the white fiberglass surfaces ahead of the helm console. 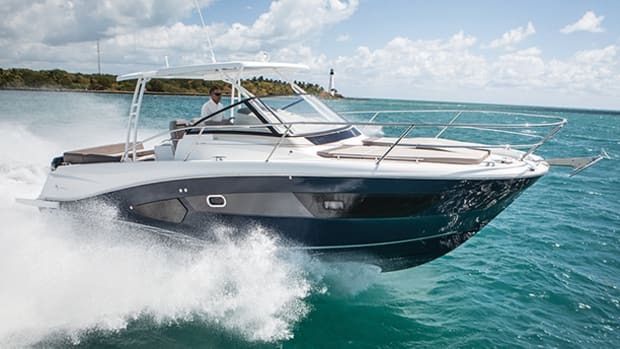 Given the excellent power-to-weight ratios of today’s larger outboard engines, it’s not surprising that performance is a strong suit on the NC 1095. It’s a blast to drive, with plenty of power when you want to take the speed up a notch and clear out some cobwebs, and surprisingly good economy when you choose to be more frugal. We touched 37 knots at 6000 rpm at wide open throttle with a lightly loaded boat, and burned a thrifty 1.07 gallon/nautical mile at 4000 rpm and 23.5 knots. Exceptional performance and an abundance of family amenities should make this new model a popular one no matter which port you call home.